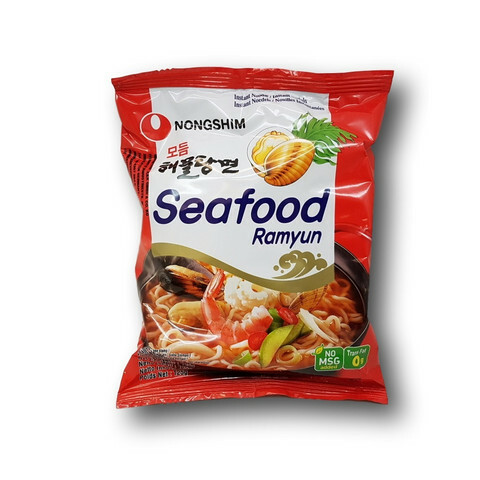 Noodle: Wheat flour, potato starch, palm oil, salt, seasoning (cuttlefish, maltodextrin, anchovy, shrimp, fish sauce [tuna fish, sea bream], soy sauce [soybean, wheat], acidity regulators [E501, E339, E500], tocopherol liquid (antioxidant [E306], emulsifier [E322, contains soy], green tea extract (oligosaccharides, tea catechin, acid [E330]), color (E101). 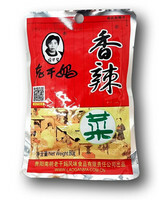 Soup powder: Seasoning (cuttlefish, maltodextrin, hydrolyzed vegetable protein [soy, corn], mussel, shrimp, salt, yeast extract, crab, wheat starch, anchovy, clam, tuna), salt, spices (chili, maltodextrin, rice bran oil, black pepper), sugar, flavor enhancers (627, E631), glucose, anti-caking agent (E551), caramel powder (maltodextrin, color [E150c]), acid (E330). 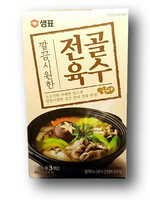 Flakes: Carrot, fish cake (pollack, potato starch, wheat starch), seaweed, green onion, kelp, mushroom. Produced in a facility that also processes barley, eggs, peanuts, milk, celery, mustard and sesame seeds.